There's no shortage of malls in Taipei to window shop in and same goes for the food courts, since most malls have a food court somewhere in their basement. 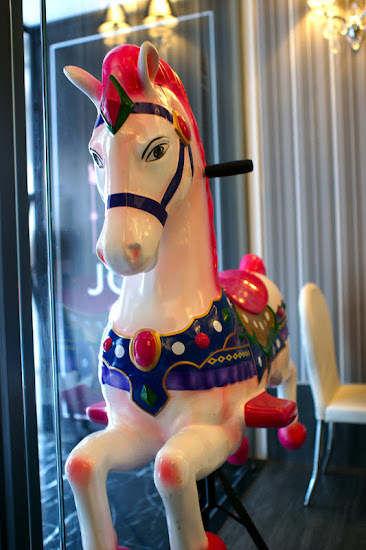 Q Square is a newer mall that some might not have discovered yet, but definitely worth checking out. Easily accessible by MRT, it is even connected underground through the walkways at the Taipei Main Station stop. The snapshots of the QSqaure food court are from a few years ago and I know since I've been there recently that it's gone through some changes since then. There's two sides to the basement floor- one side with the traditional square of food court fast food eats, plastic bento displays and plenty of seating and then the other side with mini stations of bakeries and cafes like Richard Blanc, Cloudy Cupcakes, Ariel Le Cafe and Movenpick. There's also plenty of sit down restaurants if you don't want to bother with the food court, but during peak dining hours there's often a wait- ramen, curry, tempura udon sets. Japanese bakeries like Yamazaki to stock up on some freshly baked sweet bread. Jasons Supermarket if you need to pick up some fresh fruit or gourmet items as a local or tourist. My friend didn't have as good luck with the Hainan Chicken rice which was lacking in chicken, instead fluffed up with shredded cabbage. This cold soba/udon tempura combo was also a surprise in value and size, but sadly I think the Japanese shop was changed into a different store and menu on my most recent visit. 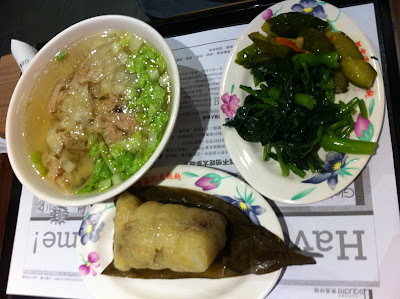 Or stick to Taiwanese eats with sticky rice ba zhang and wonton soup. One souvenir that I've turned friends onto is the kimchi flavored popcorn from Planet Popcorn. 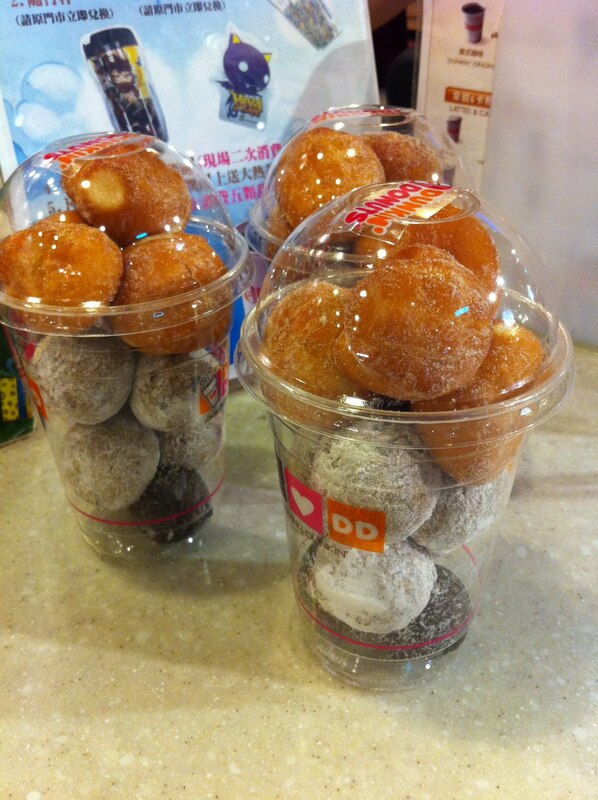 Ask for samples if you spot this stand- it's kind of addictive with a spicy, sweet and slightly sour kick. My friends usually take home a bucket or two. There are plenty of other flavors- classic kettle corn, chocolate, cheese, caramel or wasabi. 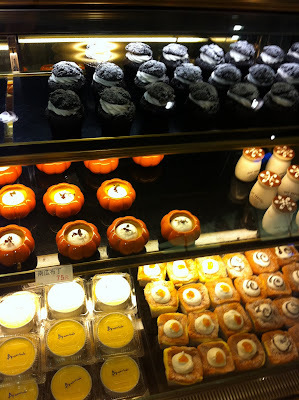 Skip these cream puffs- I bought a box as a gift and disliked their frosting like filling and soft puff. Lots to explore at Q Square- there's also restaurants like NY Bagel and Alleycats on the 1st floor; Ariel Le Cafe on the 2nd floor, and a whole floor of restaurants on the 4th floor including Crystal Spoon, Momo Paradise, Eat Together buffet and Vieshow theaters for movie watchers. Oh yeah, there's shopping too! 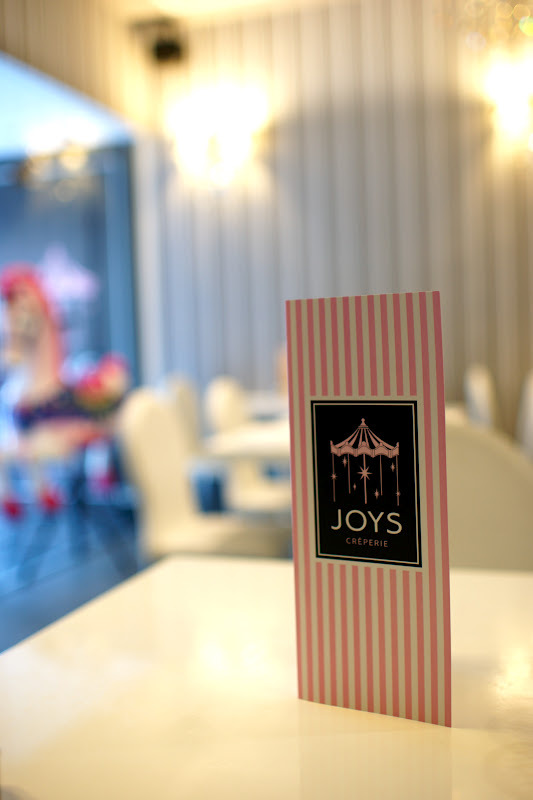 Decked out in chandeliers, pink and even a carousel horse at the entrance, it would be hard not to notice Joy's Creperie passing by. 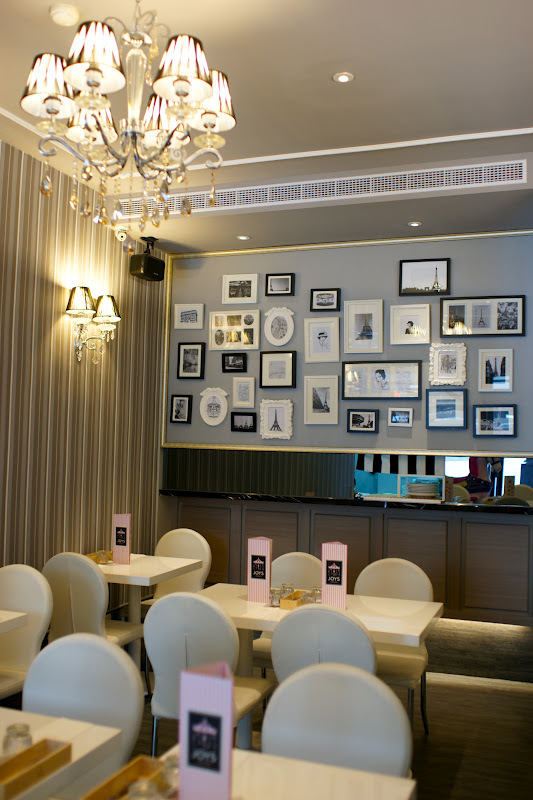 The decor uses the Dazzling Cafe template- a sort of modern romantic living room for all your besties, for the young afternoon tea crowd armed with camera phones to capture every detail and miniature eiffel towers to pose with. 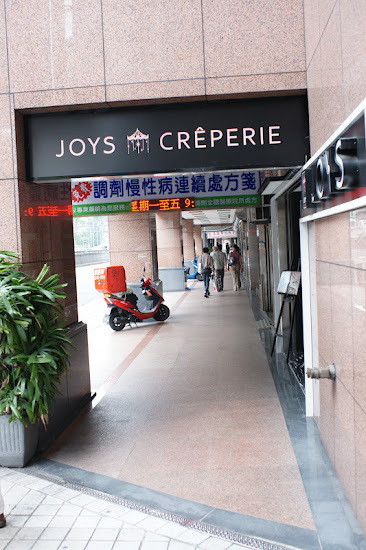 Because of the awkward location of Joy's Creperie, along Keelung Road, near the freeway entrance, some might miss it even though it's quite close to the Taipei City Hall MRT exit. On the day I was there, I was surprised a the number of office workers and guys that were there. The English and Chinese menu offers about six savory galettes and a dozen dessert crepes, with pictures for most items. 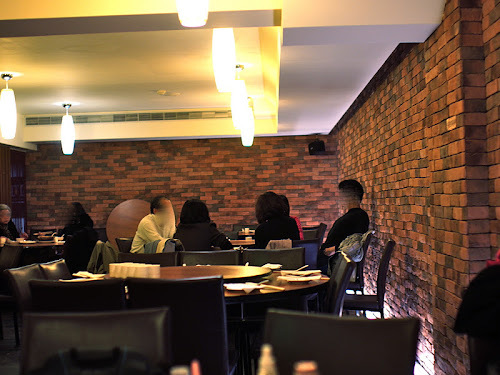 The teas, juices, coffees and drinks are around NT$130-160, which is a bit of blackmail since they are mandatory, and not more than a glass. 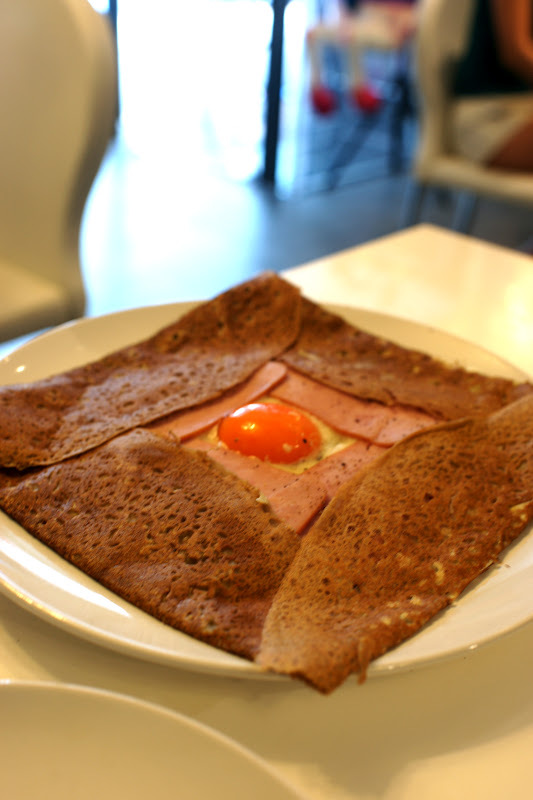 The french cheese, egg and ham galette (NT$240) was decent and a good size, though the ham tasted like Futong slices from Costco. My fruit tea was a bit of a disappointment compared to the fresh fruit teas I've had at other places filled with chunks of fruit and flavor. The ratatouille with smoked sausage (NT$260) had a sweet tomato sauce, but the sausages tasted more Taiwanese than French. It looked more bountiful piled atop the center of the galette, but made it harder to split- we had to scoop the sauce and sausages to each side to eat it. Classic salad galette (NT$180) came with a honey mustard type dressing. 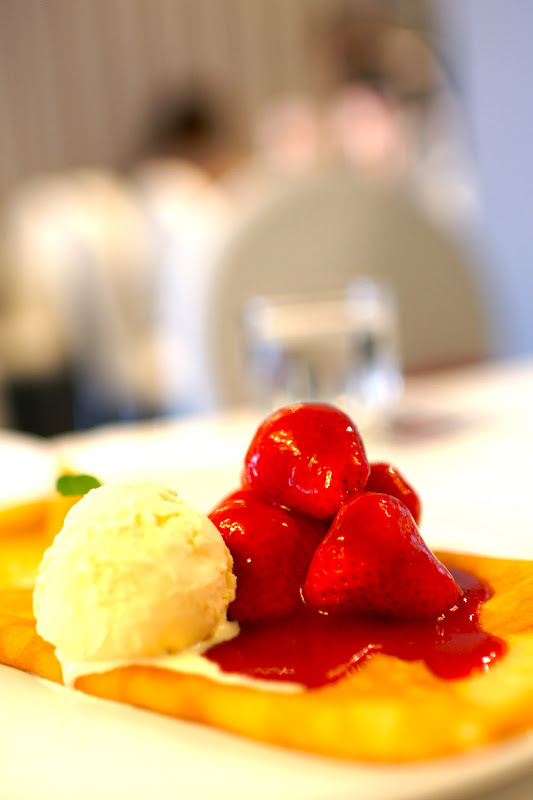 The dessert crepes were also not what I was used to what I've eaten in the US and Toronto. 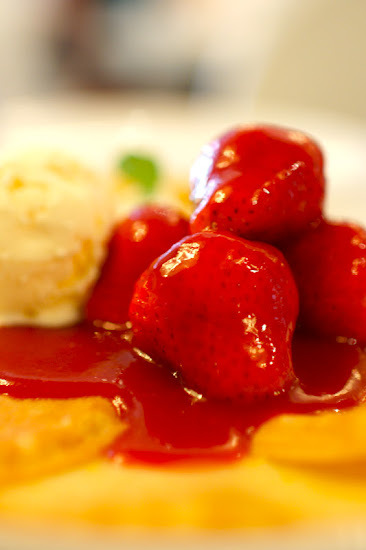 The randomly named Merry Go Round Strawberry Lover crepe (NT$240) comes with fat strawberries top the crepe, lots of syrup and a scoop of ice cream. It seemed a bit disjointed and while it was pretty, I would have preferred the strawberries with nutella or caramel instead of strawberry syrup (which they said wasn't a choice). 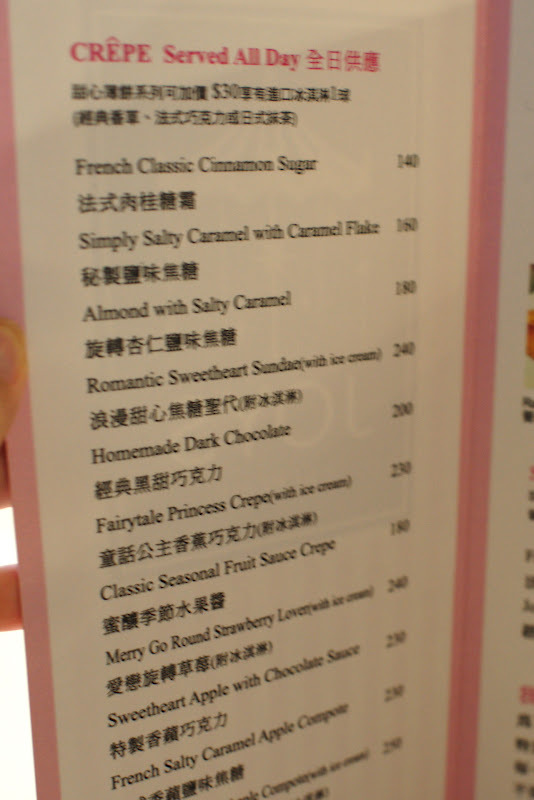 The almond with salty caramel crepe (NT$180) didn't have strong accents of salt to play off the caramel- it tasted like it looks caramel sauce with crunchy bits. 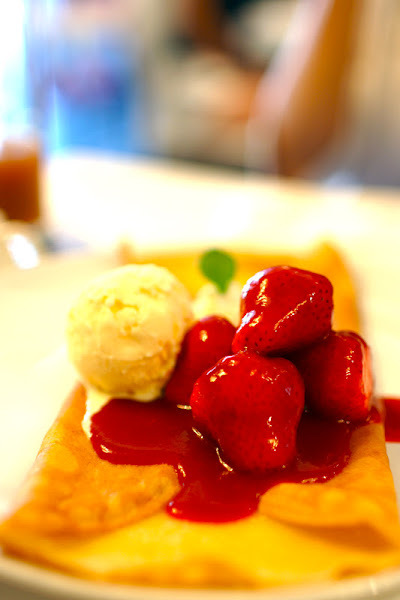 Having eaten at Creperie La Bretagne not too long before Joy's Creperie, I'd have to say Creperie La Bretagne's dessert crepes are more special and caramelized. 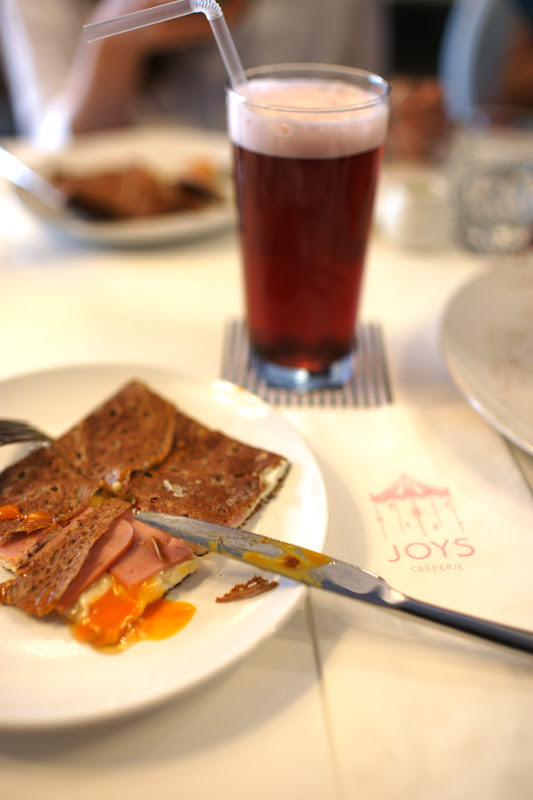 Joy's Creperie is very charming space and those who don't have other crepe experiences to compare it to might be satisfied with the experience, but the minimum drink charge might keep some from going again. Cold and rainy night in Taipei and you're tired of hotpot or Grandma's got a little cold and you want to bring some food to her... where to go? Gwoo is the answer to those needing hearty chicken soup that will warm you up from head to toe. Opened in 2007, the space still feels fairly new with the wood and brick design and can seat large groups up to 10 at their round tables in the main dining area. Private rooms are also available. Service and food is fairly quick. 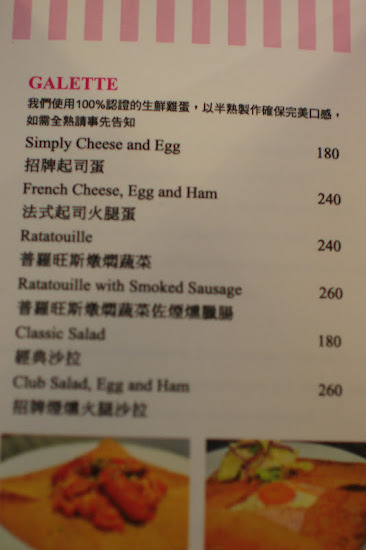 A jumble of Chinese characters in a Chinese-only menu with too many dishes to choose from can make for a confusing dining experience in Taipei. 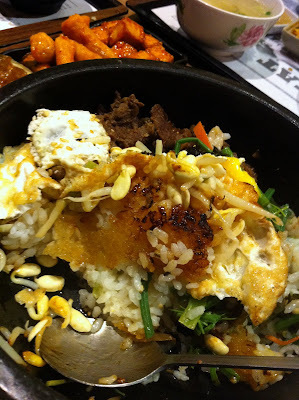 But don't let that deter you from trying some of the good eats in Taipei like GWoo. 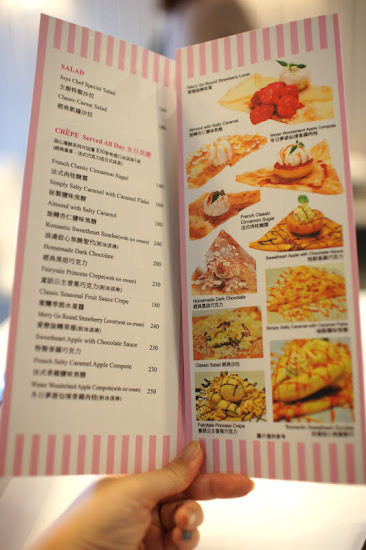 If you are desperate, you can study the collage of photos outside their restaurant of some of their more popular eats (or take a pic of it on your phone) to refer to avoid any confusion. Or just bring someone who can read Chinese, since that's what I do. The centerpiece and must order of the meal is the signature chicken soup. You can order the original version, or if you order the soup with mushrooms or cabbage and tofu, they'll serve it the original first and then add hot water and the vegetables for the second round. The Gwoo chicken soup comes in a huge ceramic clay pot, steaming and full of chicken falling off the bone as the result for being cooked for hours. Comes in small, medium and large sizes, depending on how many people you need to feed- menu prices for the original soup range from NT$360 feeding 1-2 people, jumps to NT$1400 feeding 3-4 people and NT$2400 feeding 4-6 people. Prices get more expensive from adding tofu and cabbage to mushrooms to bamboo/pith and then shark fin being the most expensive. I've also ordered to-go from them, and the soup comes bundled in a large enough plastic bowl and double bagged to ensure no leakage. The broth is so "thick" that an ultra thin layer forms to coat the soup when you don't drink the soup right away and the cooler air touches the soup. 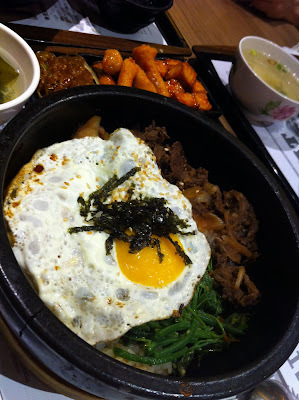 The meat is so tender, unlike some chicken soups which have all the juice cooked out of the meat. If we were in the states, there'd be some noodles floating around it. But since we're in Asia, you can order some puffed rice squares (NT$15/2) to dip in it. Now that I've been there quite a few times, here is my usual must orders. These dishes also come in small, medium and large sizes depending on how big your group is, but I usually order medium for these since I like these dishes. Scallion pancakes and string beans - the string beans are a bit more fried and greasy here than I've had it in other places, but they are addictive tucked and rolled up inside the scallion cake. I also wrap the pork inside the pancakes too. Sometimes we'll also get the stir fried noodles which sometimes comes heavy on the onions. You can see once they add the cabbage and tofu after everyone has had a bowl of the original chicken soup, they also add hot water and the soup is not as rich. Fresh fruit to end the meal. So the next time I'm craving chicken noodle soup, you know where I'll be.